Unique Fundraiser: The Sky’s the Limit! We love it when our members create unique fundraising events that really tie into their own identities and passions. With a little creativity, any interest or hobby can be tied into an activity to raise funds for RPF -- the sky is the limit! We'd like to introduce you to one of our members who took this idea quite literally. Meet Anja. Anja contacted RPF in relation to a Sky Dive event she had been planning for the summer of 2017 in the UK. 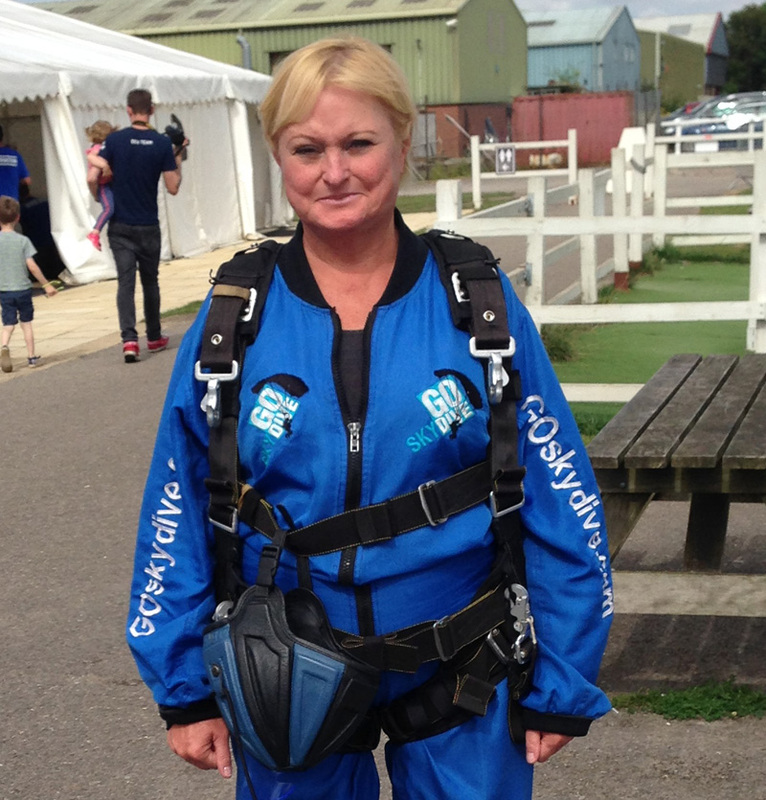 Her idea was to turn a sky dive into a fundraising event, benefiting the Rheumatoid Patient Foundation and the UK-based National Rheumatoid Arthritis Society. But rather than us tell you about it, we want you to hear directly from her what she's doing and why. RPF: Thank you, Anja firstly for reaching out to RPF and thinking of us as one of your charity partners--and also for taking the time to share a little more with us. Firstly, can you tell us a little about yourself? Anja and her husband, Alastair. Hello! Thank you for including me in your blog post. I’m very excited to be doing this charity fundraiser for RPF! 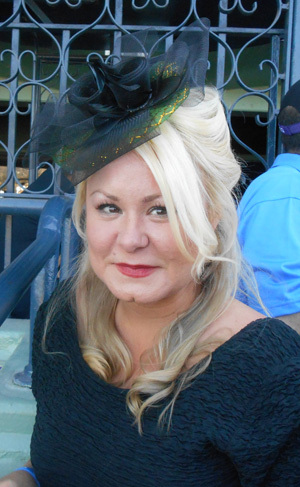 I live in Palm Springs, California, with my husband, Alastair. I have three grown children, Jessica (age 33), Ryan (age 30) and Jonathan (age 26)…..no grandkids yet, but do have a grandcat (Turbo), two granddogs (Gizzie and Moe) and a grandhorse (Sophia)! 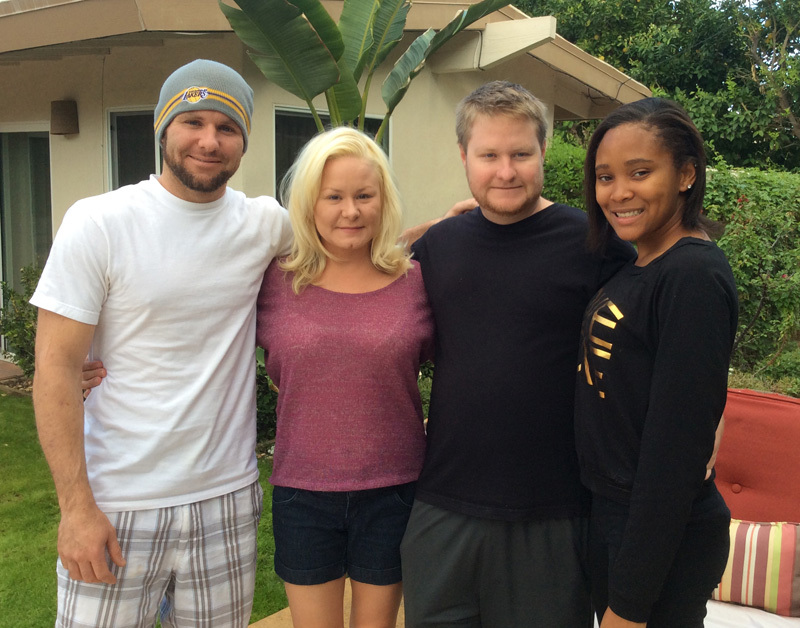 Another special person in our family is Jonathan's girlfriend, Dana. Anja's 3 kids, plus her son's girlfriend. I am an independent bookkeeper and work from my home office. When I'm not working, I love to do art, swim, read and play challenging online word games with my very hard to beat Mother! My husband and I have been married for 10 years. He is a PE teacher at a private school, but until this year, had been teaching 4th grade at the school for the last 30+ years. That is where I originally met him as he was my children’s 4th grade teacher. My late husband passed away 14 years ago after a long battle with cancer and after a couple of years, I started dating Alastair. At that time I worked at the school as the Business Manager so we were in constant contact with each other and after spending time with him, discovered we had a lot in common. My kids were shocked when they found out but extremely pleased as they love Alastair and he is a wonderful step-dad to them. My Mother, Roma, (who is from Scotland) lives in Eugene, Oregon, with my wonderful “Pops” Shannon (Step-Dad). My Father, Ralf, lives in Tucson, and is originally from Germany. I was born in Nigeria, Africa after my Father was transferred there to run an automotive dealership but came to the States shortly after where we all eventually became American citizens. Jessica is involved in the horse racing world in race track management, Ryan is employed in the hospitality industry, Jonathan is a software engineer and Dana is working her first year as a 4th grade teacher. Every summer my husband and I go to the UK for about 5 weeks to visit our many friends and family. We travel the country for about three weeks, ending up in the Salisbury area for the last two weeks in a rental cottage close to where my husband was born and raised. I love the UK and we hope to be able to split our time between there and here in the States once we retire. We both are fanatical football (soccer) fans and support a team from Southampton called the Saints. While we are in the UK, we try to see as many home and away games as possible and while in the States are able to watch them live every weekend on the TV. We sit with our Saints slippers on, our Saints team shirts and drink tea from our Saints mugs during the games. It really is quite ridiculous, I must say! But great fun! 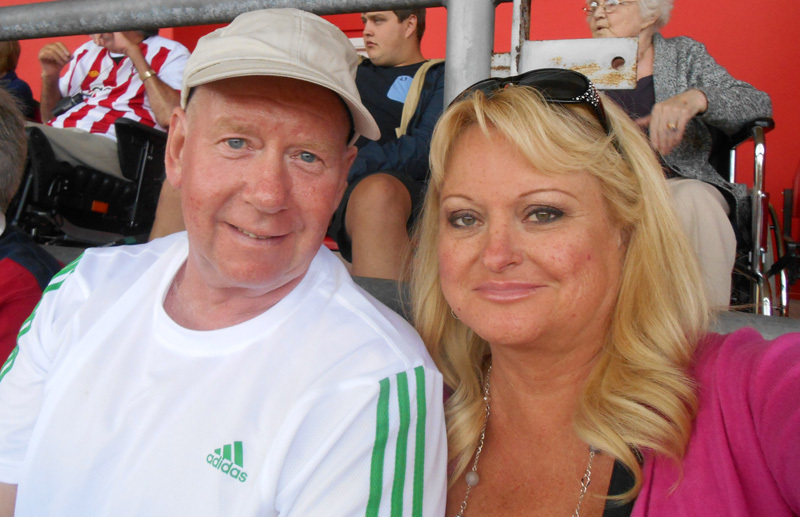 RPF: Can you please tell us about your personal connection to rheumatoid disease and why you chose RPF as one of your charity partners? 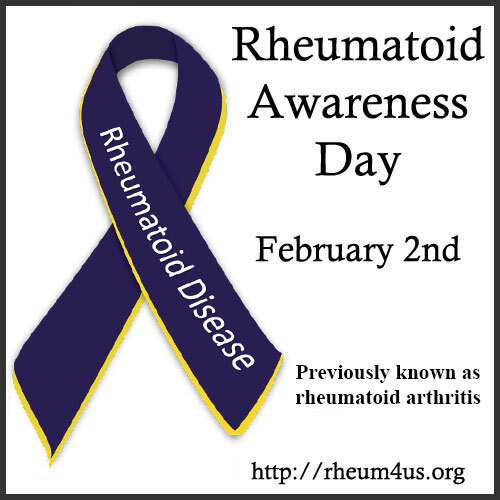 About eight years ago I was diagnosed with RA and Sjogren’s. I honestly believe, though, that I have had this for quite some time but hadn’t been diagnosed properly. I have a fantastic rheumatologist who is always there for me whenever I have any issues and has worked diligently in trying to find the right medications and has always gone to battle for me when switching to a new medication and having my insurance initially refusing to cover it. After many years of trying biologics and having a very short shelf life for helping me, I am currently doing 4 Rituxan infusions a year, in addition to weekly injections of Methotrexate. It seems to be helping me quite a bit, so hoping it will continue. Sadly, my daughter has recently been diagnosed with both these diseases as well, so it has really hit home. And, one of our good friends in the UK who has had RA for 30 years has been affected greatly. 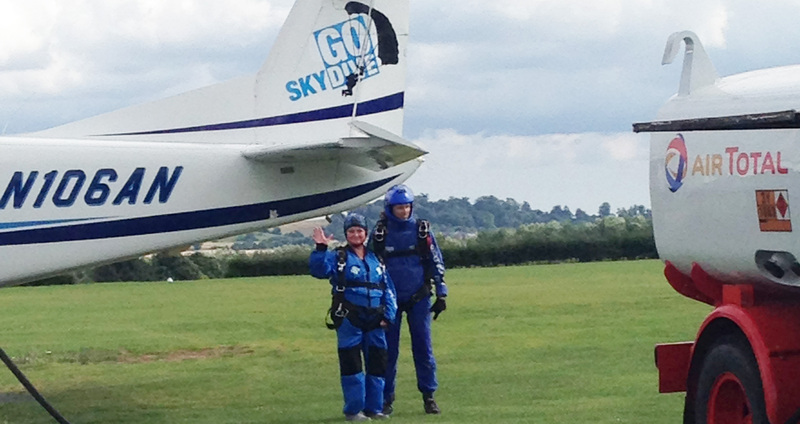 I did a tandem skydive last year while we were in the UK and was impressed with the organization’s support of people who were jumping for charities. When my husband suggested that I do an anniversary jump every year when we go back, I thought what a wonderful thing it would be for me to “jump” for a cause. 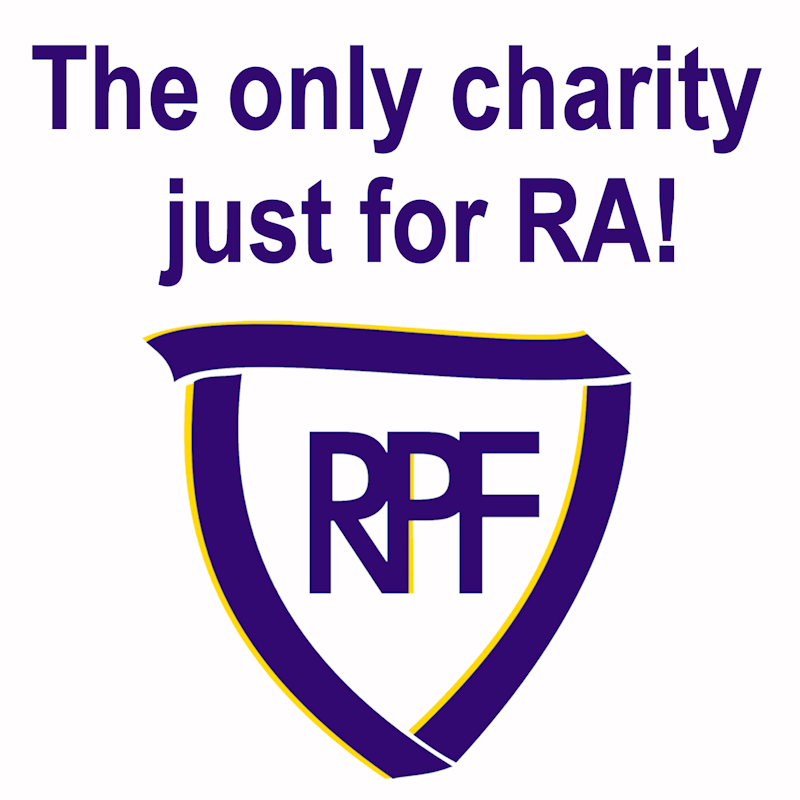 I am very fortunate to have a loving and supportive family, friends and doctor, but know that there are many people suffering from this awful disease who do not have this great support that I have, so I decided without a doubt that I wanted to benefit an RA organization both here in the States as well as in the UK. After research, I found the NRAS in the UK and RPF in the US and knew immediately that these were the organizations I wanted to support. 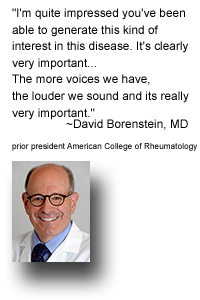 Both organizations are wonderful and are doing such great things to help people with RA as well as working on getting more public awareness about this disease. 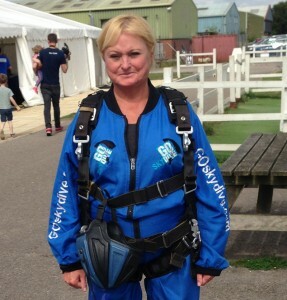 RPF: We love unique fundraisers, but we're curious: why sky diving? Why Skydiving? That’s a good question! And to be honest, many of my family and friends think I’m nuts, but that’s ok! I guess I’ve always been a bit of a daredevil. In the late 80’s, I started racing a Porsche in Vintage Road Racing and then later ran a Formula Ford series with the Sports Car Club of America. I loved it and was actually quite good. My Mother’s Dad and brothers all raced in their younger years as well and I have an Uncle who actually once beat a soon to become famous race driver called Stirling Moss. In the early 80’s I got my pilot’s license and would hear fellow pilots talk about skydivers and ask why on earth would someone want to jump out of a perfectly good airplane?! And I can’t really argue with that. I had always wondered what it would be like but never really thought any more about it and certainly didn’t ever think I would do it. But last year, Alastair and I went to a little airfield in Salisbury, and lo and behold, there was a skydiving company located there! As I watched people participating in jumps and seeing their excitement after doing one, I decided to check it out further. So after finding out more about the company and talking to their employees and getting all the information I could possibly find about skydiving, I signed up for a jump. And that’s how it all began! RPF: What do you hope to accomplish through your charity sky dive? Getting ready for the dive! Doing this skydive will not only be an accomplishment for me personally, but also something that I hope will benefit RPF and NRAS to help further the hard efforts these organizations are doing for a cause that is close to my heart. Personally, to be able to participate in something like a skydive when you have RA is in itself remarkable and am so grateful that I am able to do this. I hope to inspire and encourage those who have RA, both young and old, and to give a positive message to those that are feeling weighed down and depressed with their condition. Believe me, I know what that’s like and it can be very difficult for not only the ones who are physically and emotionally suffering from this, but to those around us as well. Knowing that maybe what I’m doing will give someone who suffers from RA hope and determination to keep on going no matter what is a great reward to me. I feel that as someone who suffers from this disease it is my responsibility to help get the word out about what RA REALLY is and to hopefully have some part in what your organization promotes for awareness, support, advocacy, and ultimately to one day see a cure. RPF: What are the specifics of your event and where can people go to learn more and donate to your event? My skydive will be done with a company called GoSkydive on Thursday, August 3, 2017, at Old Sarum Airpark in Salisbury, England. 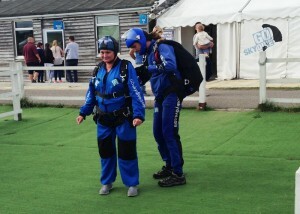 Last year I jumped from 10,000 feet but this year I will be doing it at 15,000 feet. After the first of the year, I will be starting a Facebook page and webpage solely for the purpose of this skydive fundraiser and will have links to a donation site. I want everyone to know that my skydive is completely self-funded and that 100% of all monies donated will go entirely to the non-profits. If anyone wants to get in contact with me prior to kicking off the fundraiser so that I can put them on my contact list, or have questions, etc., etc., that would be great! You can contact me here. Visit Anja's Fundraiser Website or Facebook page for more details! Anja will be getting a video and professional photographs during her sky dive and we will share those with you afterwards! 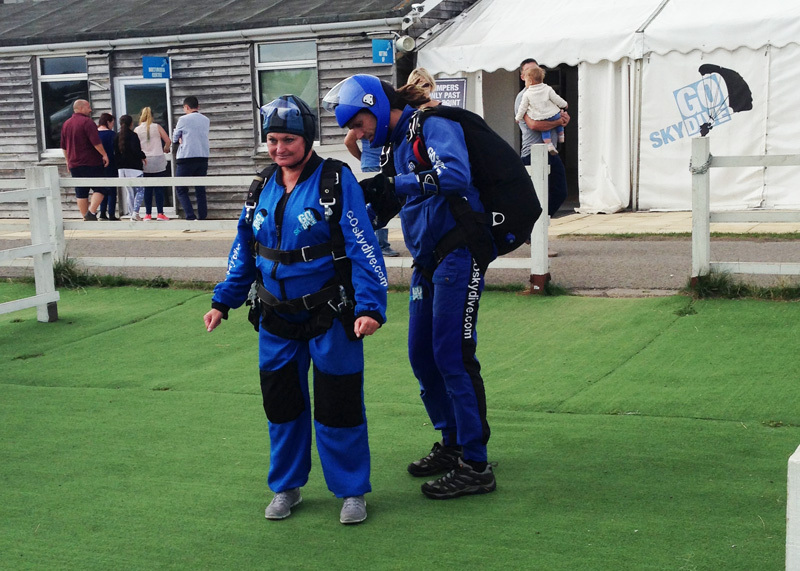 In the meantime, check out the video below to see Anja's previous sky dive and the inspiration for her charity dive in August! Interested in creating your own fundraising event? Contact us with your ideas and we'd love to partner with you in your efforts!